Among other things, senators asked Mick Mulvaney whether the CFPB suppressed a report, as has been alleged, that found evidence of banks charging dubious account fees to college students. The letter arrived on Mulvaney's desk less than three weeks after the CFPB's student loan watchdog, Seth Frotman, stepped down, writing in a fiery resignation letter to Mulvaney that under the acting director's leadership, "the Bureau has abandoned the very consumers it is tasked by Congress with protecting. Instead, you have used the Bureau to serve the wishes of the most powerful financial companies in America." The Trump administration has made no secret of its desire to protect loan servicers from tough oversight. One year ago, the Education Department ended agreements to share information with the CFPB and collaborate with the bureau on enforcement. In March, the department released guidance arguing that loan servicers, as federal contractors, should be exempt from state efforts to more closely regulate them. And in May, Mulvaney called for a major shake-up in Frotman's division. The Office for Students and Young Consumers was folded into the bureau's Office of Financial Education, signaling a symbolic shift in mission from investigation to basic information-sharing. "Taken together," the senators wrote in their new letter to Mulvaney, these changes leave "millions of families with more than $1.5 trillion in student loan debt forced to fend for themselves against an industry with an abundance of well-documented predatory practices and abusive behaviors." How many supervisory examinations of large student loan servicing companies has the CFPB performed in the last 10 months? How many enforcement actions have career staff recommended be undertaken against student loan servicers? Have any of these recommendations been acted upon to date? Senators also asked Mulvaney whether the CFPB suppressed a report, as Frotman alleged, that found evidence of banks charging dubious account fees to college students. If true, the letter says, Mulvaney should provide the report and all documents related to it. The group, made up of 14 Democrats and one independent, have given Mulvaney until Oct. 1 to answer their questions. A CFPB spokesman could not be reached for comment. 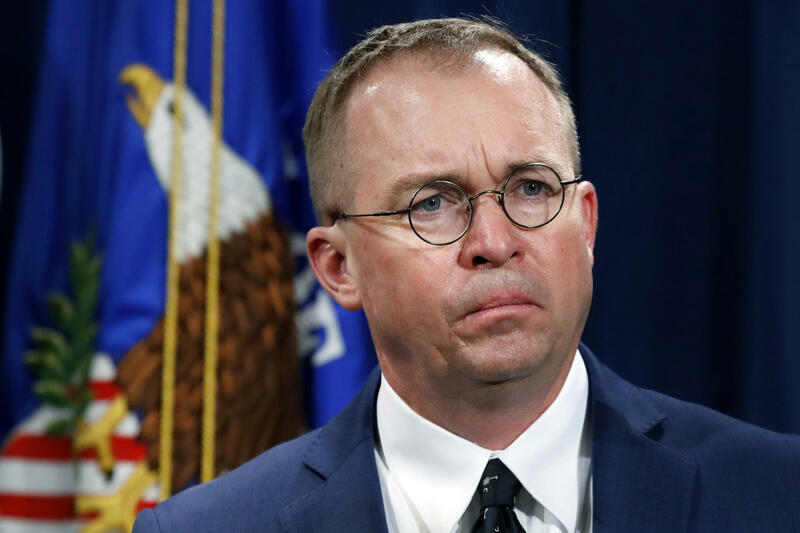 In the wake of Frotman's departure, Mulvaney offered little in the way of reaction. In an interview Wednesday on CNBC, he said, "I never met the gentleman. Don't know who he is." "Here's what we did at [Frotman's] part of the student loan operation, which is the statute gives us responsibility for private student loans, OK? That represents about 8 percent of the market. Under a handshake agreement within the Obama administration, the bureau was going after and regulating public student loans, which is most of them, 92 percent of them. We said, 'No, no, no. The statute says we're gonna be responsible for private student loans. That's what we're going to do,' and [Frotman] apparently didn't like that." Mulvaney's words caused some confusion, making it sound as though the entire CFPB would be abandoning its role as a watchdog of the federal student loan market, though a spokesman later clarified that Mulvaney was not referring to the bureau in general but specifically to the ombudsman's office. The CFPB has handled more than 60,000 student loan complaints since 2011 and returned more than $750 million to aggrieved borrowers, according to last year's report from the bureau's ombudsman's office. Since the Great Recession, the bureau has provided aggressive oversight of the student loan industry, even suing for-profit giants ITT Tech and Corinthian Colleges. Last year, the CFPB sued Navient, arguing that one of the nation's largest student loan servicers "created obstacles to repayment by providing bad information, processing payments incorrectly, and failing to act when borrowers complained." Navient called the allegations "unfounded." Before joining the Trump administration, Mulvaney was a Republican congressman from South Carolina and an outspoken critic of the bureau. He once called the CFPB "a joke ... in a sick, sad kind of way."